Note: Go heavy on the Front Squat and work up to a 1 Repetition Max. For the AMRAP, use 50 % of your 1RM load. Prescribed weight for the Kettlebell Swing is up to 53lb. for men and 35lb. for women. Congratulations to Sammy on being recognized as Athlete of The Week. 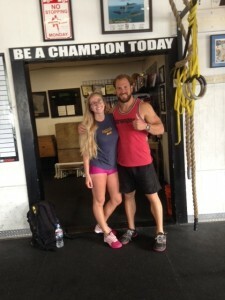 Sammy is approaching her 1 year CrossFit training anniversary and the results have been amazing. Last week, Sammy nailed two personal records, including a 80lb. Thruster and 100lb. Back Squat. Over the past year, she’s also achieved her first Pull-up and Rope Climb. Sammy is known in the gym as a fierce competitor, who is quick with a smile and word of encouragement for her peers. Keep up the inspiring work Sammy, and keep letting your light shine! Greg Amundson and Bailey Feeney will be co-teaching the new Yoga Bell class on Monday nights from 6:00 to 7:00 PM. Created by Greg and Bailey, Yoga Bell is a class that combines the traditional Warrior poses of Yoga with the strength and endurance skills of Kettlebell technique. The class follows the sequencing of our Thursday night Warrior Yoga class, while seamlessly incorporating challenging Kettlebell skills and drills. The result is an experience that offers all the benefits of a sound Yoga practice with the conditioning you’d expect with a Kettlebell workout. Yoga Bell will be offered free to all CrossFit Amundson Athletes. Today’s class meets at our Krav Maga studio. We look forward to seeing you there. Tonight from 7:15 to 8:00 PM is the official “Kida” or “Bow In” of our Krav Maga Phase A class. Phase A will be a three month commitment that will include KravFIT conditioning workouts, combative skill development, Self Defense and Weapon Defense training. Phase A will culminate in a test, and promotion to Phase B will be recommended for those who are successful. If you are interested in Krav Maga and are a current CrossFit Amundson Athlete, now is the time to start your training. Krav Maga is included in the CrossFit gym enrollment and no previous Self Defense or Martial Arts training is required. You must be in attendance tonight or Wednesday night to be included in the Phase A summer class. The next Phase A will start in October. Please visit Krav Maga Santa Cruz for further details.